Monotonous motorway driving severely tests the attention and concentration of car drivers, among others. Traffic can flow smoothly over long distances. But then there is unexpectedly an incident that forces you to act quickly and correctly: for example, a vehicle braking suddenly just before the end of a traffic jam, an accident, temporary road works or even a car driving the wrong way. Car drivers should be more effectively warned and protected from such and similar hazards in future. Real-time communication and data exchange between vehicles and with the traffic infrastructure may make this possible. Cars that “talk” to each other as well as to gantries, roadside emergency telephones and light signals, may seem like a scene from a science fiction film to most car drivers today. However, car manufacturers and their suppliers have actually been working together with universities and other research institutes for a long time on technically realising so-called intelligent transport systems and services (ITS). Companies and researchers from Saxony-Anhalt are also heavily involved in this pioneering work. One of these recently completed sub-projects on cooperative intelligent transport systems is called abbreviated ANIKA (Equipping roadside emergency telephones for V2I communication on motorways). 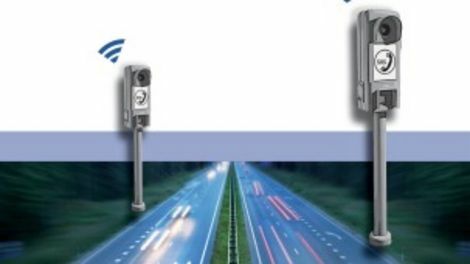 “It investigated whether the current roadside emergency telephones on Germany motorways can be technically equipped so that they can be used for intelligent traffic management,” says Andreas Müller, Head of the ANIKA project in Saxony-Anhalt. The federal states Lower Saxony and Saxony-Anhalt have financially supported the two ANIKA sister projects. Staff from “Galileo-Testfeld Sachsen-Anhalt” and the Magdeburg Otto-von-Guericke-Universität are working together with the companies ifak system GmbH, Tonfunk Systementwicklung GmbH and the Fraunhofer IFF in the Saxony-Anhalt project consortium. There are currently roughly 16,000 orange and red roadside emergency telephones along German motorways, at their exits and junctions, including 587 in Saxony-Anhalt alone. Car drivers can use these to speak to a control centre by phone in the event of breakdown or an accident, which then organises assistance from the police, fire brigade, rescue and breakdown services. This warning service is undoubtedly useful and has proved its worth. However, valuable time may pass between the breakdown or accident happening on the motorway, making the warning call and the rescue services arriving, time which could be significantly reduced by the intelligent, automatic forwarding of information relevant to traffic from the broken down vehicle to the nearest roadside emergency telephone and the responsible emergency call centre. “The idea was to technically equip roadside emergency telephones so that they record the wireless data sent by passing vehicles, forward this data to a control centre and send important incident data for the relevant motorway section back to the passing vehicles in real-time,” says the project manager Andreas Müller. Vehicles that come to a standstill on the motorway due to different incidents should therefore be recorded as quickly as possible and the traffic behind them can be warned as close to real time as possible. “The ANIKA project’s aim is to support anticipatory driving and therefore improve road safety and efficiency,” says Thorsten Szczepanski, Managing Director of idak system GmbH. The ANIKA project team recently proved that this technology already works in principle today during a public event with representatives from politics, the press and business at the outdoor grounds of the memorial to German partition on the A2 near Marienborn. “Integrating the current roadside emergency telephones into future road management and traffic communication has several advantages,” says graduate geographer Andreas Müller. For one, communication via roadside emergency telephones does not depend on the mobile communications network. At the same time it provides accurate location data for an incident. The exact position of all currently 16,000 roadside emergency telephones is known, i.e. geographically referenced, as a result new, potential accident hazards can be accurately spatially allocated and can provide the traffic ahead on the respective motorway sections with the necessary information. The future intelligent transport infrastructure will also change the current traffic news on the radio. Why does the driver on the A2 heading towards Hannover need to be warned about traffic jams on the A8 Salzburg heading towards Munich, as is usual with traffic news now? This information is insignificant to them and may be rather distracting. It is far more important for a car driver to know whether smooth flowing traffic is expected over the next few kilometres on their route and/or whether and when alternative routes make sense. “Intelligent” roadside emergency telephones may contribute to this in future. “With the ANIKA project we can get closer to the target of avoiding accidents and traffic jams by intelligently regulating the flow of traffic,” says Andreas Müller. Other practical tests on the A9 in Bavaria and perhaps also on road sections in Saxony-Anhalt and Lower Saxony are to follow shortly.